During a plenary debate at the European Parliament (EP) on December 17th, MEPs from all political groups condemned the raids on the headquarters of Turkey's top-selling daily Zaman and of the Samanyolu Broadcasting Group, as well as the detentions of journalists and media professionals carried out as part of the operation. Expressing concern that Turkish President Recep Tayyip Erdogan is leading his country in the wrong direction, away from the core values and principles of the EU, which Turkey is aspiring to join, some lawmakers even called for suspending EU membership talks with Ankara. One of them was French MEP Edouard Ferrand, a member of the EP's Delegation to the EU-Turkey Joint Parliamentary Committee. He viewed the police operation on December 14th as yet another "evidence that Turkey is not a democratic country". "Once again, the press is gagged by Erdogan. We see a police state," Ferrand said. "As a member of the delegation to Turkey, I would suggest two solutions: one, end visa liberalization; two, end all accession negotiations." "The raids against journalists are unworthy of a democratic state. Freedom of press and speech are vital elements of any democratic state that follows the rule of law," Keller, who is vice-chair of the EP's Group of the Greens/European Free Alliance, stressed in comments e-mailed to OBC a day before the plenary debate. "Erdogan is obviously trying to silence his critics which is not something a head of state should do," she added, noting also the need for the EU "to give priority to the areas of justice and fundamental rights in accession talks. So far, these issues have been left out in the negotiations with Turkey and this has contributed to the current problems. We need to give priority to human rights over single market rules." 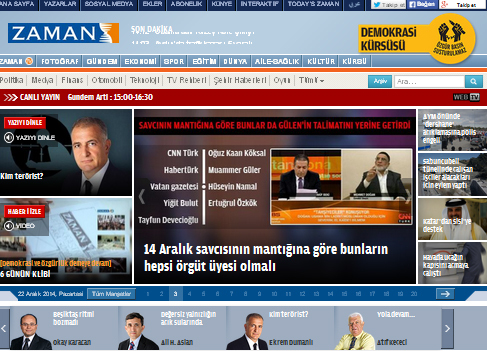 Daily newspaper Zaman and the Samanyolu TV are both affiliated to U.S.-exiled Sunni cleric Fethullah Gulen, who once was a close ally of Erdogan to eventually turn into a bitter critic and opponent of the ruling Justice and Development Party's (AKP) leader. Among those arrested were Zaman editor-in-chief Ekrem Dumanli, the head of the Samanyolu media group, Hidayet Karaca, as well as several other journalists and soap-opera screenwriters. Istanbul's prosecutor, Hadi Salihoglu, was quoted as saying that warrants had been issued against a total of 31 individuals. Independent Turkish press agency Bianet reported that all were charged with "establishing, managing and being a member of a terrorist organization and committing fraud". Dumanli was released conditionally on December 19th, but is banned from leaving the country. On the same day, a Turkish court ordered an arrest warrant for Gulen. The operation conducted by teams of Turkey's anti-terror police took place three days before the first anniversary of the biggest corruption and bribery scandal to have shaken the country in its recent history. Three ministers in the cabinet that Erdogan headed as prime minister at the time and their sons were implicated and a total of 53 individuals were arrested as part of the investigation. Two days after the raids on Zaman and Samanyolu TV, an Istanbul court decided to drop the case, saying it would not pursue the charges against the 53 people. After the scandal erupted on December 17th 2013, Erdogan pointed a finger at Gulen and his followers in the bureaucracy, claiming it was part of a plot to oust the AKP from power. EU foreign affairs chief Federica Mogherini and enlargement commissioner Johannes Hahn, who visited Turkey several days before the arrests, issued a joint statement on December 14th, criticizing the operation as "incompatible with the freedom of media, which is a core principle of democracy". "We expect that the principle of presumption of innocence will prevail and recall the inalienable right for an independent and transparent investigation in case of any alleged wrongdoing, with full respect of the rights of the defendants," they said. The two officials also stressed that any aspiring EU member must show "full respect progress for the rule of law and fundamental rights" to make progress in the accession process. But Erdogan lashed out at the EU, insisting that the arrests had nothing to do with press freedom and promising to continue waging a war against "those who engage in dirty dealings" and the "parallel state" set up by the Gulenists. What was happening in Turkey today was part of a "normalization process" and of planting the seeds of a "New Turkey," he said in a speech in the Tupras oil refinery outside Istanbul on December 15th. "We have no concern about what the EU might say, whether the EU accepts us as members or not, we have no such concern. Please keep your wisdom to yourself," Brussels-based online news portal Euobserver quoted Erdogan as saying in the Tupras oil refinery outside Istanbul on December 15th. "The EU should not intervene in acts taken by the police and judiciary against entities that jeopardise our national security. It should mind its own business." Erdogan's AKP came to power in Turkey back in 2002 and the country began its accession talks with the EU three years later. Thirteen of the 33 negotiating chapters have been opened so far, with only one of them provisionally closed to date. Meanwhile, Turkey has fallen more than 50 places in Reporters Without Borders' Press Freedom Index in the last eight years -- from 98th among 168 countries in 2006 down to 154th among 180 nations today. Until a few months ago at least, Turkey was often described as one of the global leaders in terms of number of imprisoned journalists. Therefore, media watchdogs and press freedom organizations, such as the International Press Institute (IPI) joined the chorus of critics of the mid-December raids. "The latest developments make an already troubling situation worse," IPI Senior Press Freedom Advisor Steven Ellis said in an e-mailed statement in response to an OBC request for him to comment on the case. "The Erdogan-led government has a habit of using anti-terror laws to bring independent media to heel. Through this, and coverage and accreditation bans, the government has made it increasingly clear that only certain topics can be covered, and only in a certain way and by certain people." Given all different types of pressure they face, Turkish journalists do not have much choice -- they can either obey the rules, or risk being fired or even sent to prison, according to Ellis. The latest developments "also illustrate how stalled the EU accession process currently is," he added. "Disillusionment has been brewing in Ankara for some time, and Erdogan appears to have decided instead to focus on his vision of creating a proud, "New Turkey". The willingness to unleash another wave of arrests of journalists, and Erdogan's comments telling EU leaders to mind their own business, show that while Turkey may be willing to accept EU membership, its leaders appear to have little appetite for pursuing it."